Whilst Pence grew up in a Christian home, he says that it became personal when he gave his life to Christ in college. "My faith became my own when I made a personal decision to trust Jesus Christ in my freshman year in college. That night, my heart was literally broken wide with gratitude and joy. When I came to realize that what happened on the cross, in some small measure, happened for me." Pence continues "the truth is that the strength of our nation has come out of our communities of faith. Throughout our history, it has been the voices of faith that have driven our nation to a more perfect union." 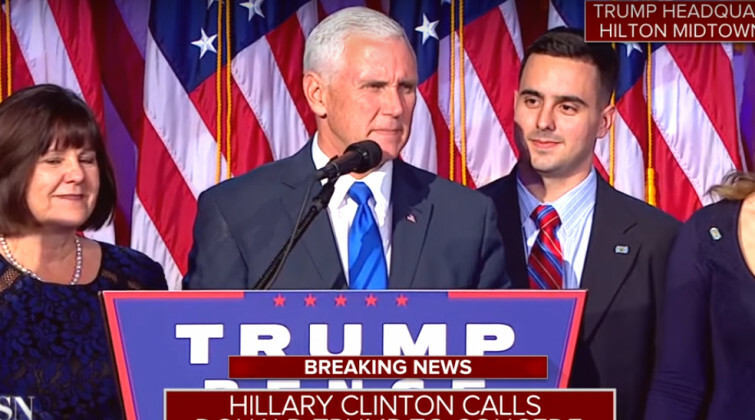 Pence then offers a call to prayer for the US. "I'd like you to encourage you to do one more thing. And that is to bow the head and bend the knee in the days that remain in this election. Pray for our country. Pray, not that God would be on our side, but that we would be on his side." "I truly do believe in my heart of heart, that what's been true for millennia is still true today. That if his people, who are called by his name, will humble themselves and pray, he will again do as he's always done, he'll hear from heaven, and he'll heal our land. This one nation, under God, indivisible, with liberty and justice for all." "All I know today is that I need Him more than ever. He is the center of my life, and my family's life."